Feel free to correct my Italian! 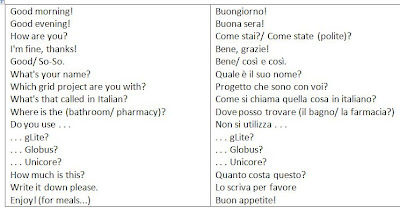 Is anyone else learning phrases they want to use in Catania? - What's your name? = Qual'è il suo nome? - Which Grid Project are you with? = In quale progetto Grid stai/state (polite) lavorando? - Enjoy! = Buon appetito! At the bar : I'm going to need something stronger than this caffe' macchiato, my jobs won't run - mi servira' qualcosa un po' piu' forte di questo caffe' macchiato - non girano i miei job ! Don't worry Danielle! Again, great job! Mmmm... it would be nice to add this kind of extensions to the output generated by the glite-job-status or gwps commands ;-).